Chef Bill Clifton pauses (very briefly) from his duties as chef and co-owner at Georgetown’s The Counting House to discuss his Food Network experience. “Beat Bobby Flay” is a 30-minute show with two head-to-head competitions. First, two chefs prepare a dish of their choice, both including the same special ingredient. Next, celebrity chef Flay squares off against the winner, both preparing a dish of the visiting chef’s choice. Clifton’s first cooking gig was at age 16, at Hardee’s. The oldest of seven kids living near Milford, Clifton said he wanted a car, but not to earn it by farming with his dad or baking with his mom. Over time, he cooked at more restaurants, and it stuck. He honed his skills at Just in Thyme in Rehoboth Beach with chef Jon Orlando; culinary school and the Black Bird in Chicago; and the French Laundry in Napa, Calif.
As a chef, “It’s a constant search of who I am. The world offers so many flavors and things that you enjoy one thing to the next,” Clifton said. He said he also enjoys cooking pho (a brothy noodle dish originating in Vietnam) and stocks, and he loves to eat oysters, wild game and other Eastern Shore foods. 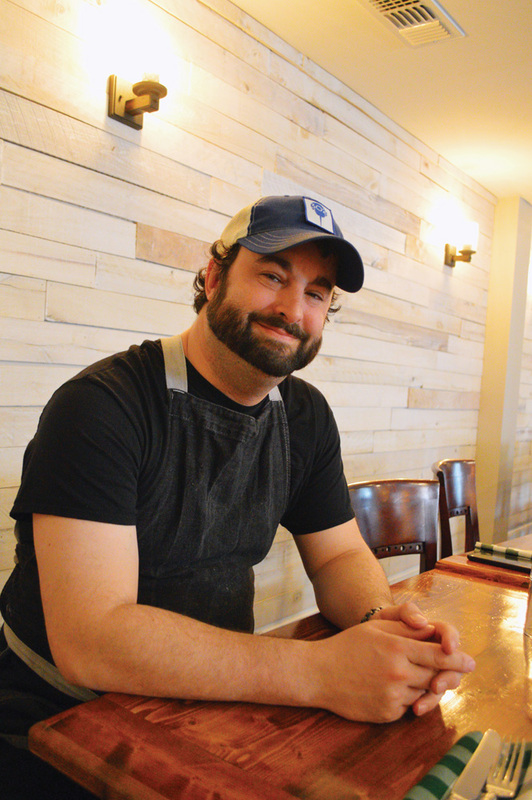 Clifton helped open the Henlopen City Oyster House and the Dewey Beer Company, as well as The Blue Hen, which was a James Beard Award nationwide semifinalist. In August of 2018, Clifton and his cousin-in-law, Miguel Batiz, took over the restaurant at the Brick Hotel in Georgetown. This January, they rebranded it as The Counting House, with a new, yet classic look, at times rustic and elegant, with Edison bulbs and open fireplaces. Clifton’s “Beat Bobby Flay” episode filmed in March of 2018. It was a full year before producers allowed the guest chefs to advertise it. “They scour the country” for contestants and likely called Clifton because of the oyster house’s success or the James Beard Award semi-finalist notation, he speculated. “Beat Bobby Flay” has amassed about 200 episodes over five years on the air. Filming of the “Pump It Up” episode featuring Clifton was completed in a 12-plus-hour day in Brooklyn (half cooking and half talking-head interviews), plus all the prep time. Clifton said he didn’t expect to sweat so much — literally. Contestants are supposed to bring simple shirts, but when his options were all rejected, he was stuck wearing a sweater, surrounded by hot ovens and studio lights. But Bobby Flay was very nice, he said. All chefs have different styles, and Flay is no exception. “There’s your haute cuisine, … then there’s Bobby Flay, which is your fine dining; and there’s chefs who make really good cheesesteaks. There’s no shame in what you do, if you’re good at it,” Clifton said. Overall, Clifton said, he enjoyed the experience, and he would try doing another show if given the opportunity. Back at The Counting House in Georgetown, Clifton and co-owner Miguel Batiz want to continue bringing good food to the people, understanding, he said, that people like the classics, but also introducing incredible new flavors (in baby steps). “Bill’s … always trying to look at food in a different way, always trying to come up with something that will kind of ‘wow’ people,” said Batiz, noting that he wants to use local ingredients and build partnerships with local farmers and producers. People can now see that for themselves. The Counting House will be open for lunch and dinner, as well as future beer and wine dinners, and reception rentals, and has an open rooftop seating area. Meanwhile, Clifton said he couldn’t provide any hints about his television debut. “You have to watch the full episode,” he mused. But win or lose, how did feel about the outcome? “I feel great,” he concluded with a laugh. “Beat Bobby Flay” airs on the Food Network on Thursday nights at 10 p.m. Episode 2004, “Pump It Up,” will feature Bill Clifton, co-contestant Stephan Bogardus of Long Island, comedian Tony Rock and chef Alex Guarnaschelli, as well as judges Melba Wilson, Jimmy Bradley and Michael Lomonaco.